Plug-in compatible with many of today s gate operators. Power Supply requirement 10 to 30 Volts AC or DC, 5mA nominal. 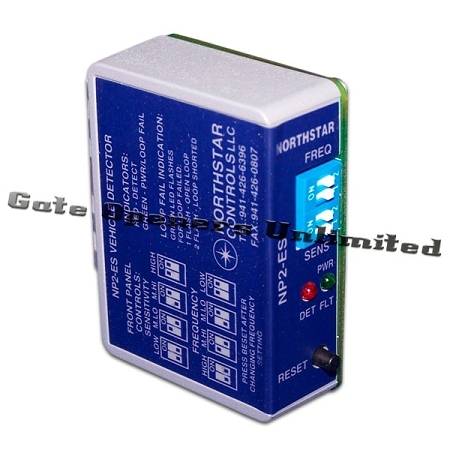 The Northstar Vehicle Detector - NP2-ES Single Channel has been specifically designed and engineered for use in the Parking/Access Control industries and is designed for plug-in compatibility with many contemporary gate operator designs. With standard operations including compatibility with all radio controls and more, the Northstar Vehicle Detector - NP2-ES Single Channel covers your low power, plug-in detection needs. The Northstar Vehicle Detector - NP2-ES Single Channel wide inductance range allows for use with small loops sometimes found in the Parking/Access Control industries (for recommended loop sizes please consult the Northstar Loop Information Guide). Separate indicators for power/fault and detect output provide for quick visual verification of proper operation. Loop diagnostics are easily viewed with the front panel power/fault indicator. Sensitivity controlled by front panel DIP switch. Medium sensitivity is used for most applications; this is a setting of 1 or 2. Always use the lowest sensitivity setting that detects the desired vehicles. Reset front panel reset performs a hard reset of the detector. Call Delay select from delay off and 2 second delay. Permanent Presence select from 60 minute and permanent presence. Detect Output is fail secure, loss of power does not cause a detect output to be placed. Output Rating: Solid State both Detect and Fail. 30mA Maximum current sink. Outputs are protected from over-voltage or polarity reversal. Power: 10 to 30 volts AC or DC, 5mA nominal. Lead-In Length: up to 2500 ft. with proper lead-in and loop. Mechanical: 2.4 H x 2.25 D x 0.8 W.
- Flashes during a fault condition. - Fault flash sequence: Single flash and pause = Open Circuit Loop, Double flash and pause = Shorted Loop. - Red, solid during detect. Power Saving Mode: While in normal operation with no fault indication, the Green LED will extinguish after a period of 2 minutes. A power interruption or reset will re-illuminate the Green LED. Note: The above connections are shown with correct power supplied and no vehicle present.